L-Lactate Assay Kit (Colorimetric) (ab65331) uses an assay protocol where lactate is oxidized by lactate dehydrogenase to generate a product which interacts with a probe to produce a color (λmax = 450 nm). The kit detects L(+)-Lactate in biological samples such as serum or plasma, cells, culture and fermentation media. There is no need for pretreatment or purification of samples. L(+)-Lactate is the major stereo-isomer of lactate formed in human intermediary metabolism and is present in blood. 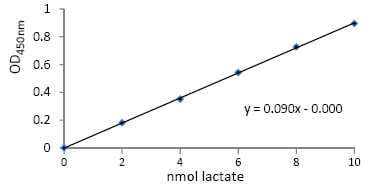 D(-)-Lactate is also present but only at about 1-5% of the concentration of L(+)-Lactate. Lactate (CH3CH(OH)COO-) plays important roles in many biological processes. Abnormal high concentration of lactate has been related to disease states such as diabetes and lactate acidosis, etc. L(+)-Lactate is the major stereoisomer of lactate formed in human intermediary metabolism and is present in blood. The lactate to pyruvate ratio reflects the redox state of the cell and describes the balance beween NAD+ and NADH, which is dependent on the interconversion of lactate and pyruvate via lactate dehydrogenase (LDH). Functional studies -ab65331Image from Kelly CE et al., PLoS Biol 11(4), fig2d. oi: 10.1371/journal.pbio.1001538. Plasma lactate concentrations were determined using L-Lactate assay kit (ab65331) in Ark2C+/+ and Ark2C−/− (Arkadia-like gene) mice. Linearity of dilution: concentration of L-Lactate in differently diluted (X-axis) biological samples, demonstrating a linearity of 89%-111% (concentrations corrected for by factor of dilution; duplicates; +/- SD). 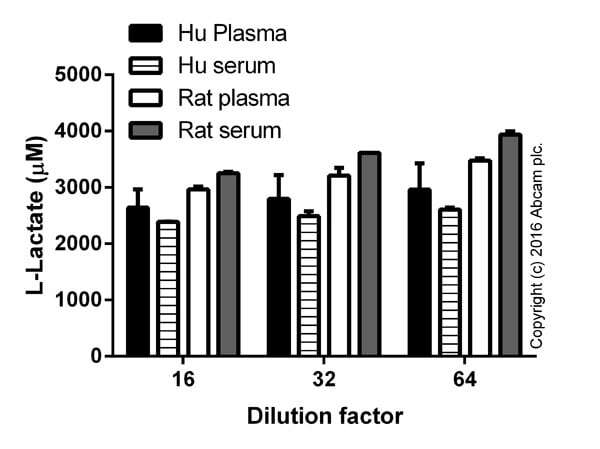 Relative signal (RFU) in unfiltered human plasma (dilution 1:8), comparing L-lactate signals with background reading (no enzyme) after 10 minutes of incubation (duplicates +/- SD). Standard curve with background signal subtracted (duplicates; +/- SD). Lactate Standard Curve. The assay is performed following the kit (ab65331) protocol. Concernant les dosages nous avons réessayé une fois mais sans amélioration des résultats. Par la suite, nous avons fait doser les échantillons dans un service de Biochimie qui utilisent des kits d'un autre fabricant et cette fois-ci les résultats étaient corrects. Merci pour cette information. Je suis très désolée que ces kits n'ont pas permis de faire les dosages attendus. Je vais volontiers organiser une note de crédit ou un remboursement pour vous. Alternativement je peux aussi organiser l'envoie de deux kits de remplacement, mais je pense que vous préférez probablement la note de crédit.Est-ce que vous pouvez me confirmer quel 'est la solution que vous préférez? Merci beaucoup. Je reste à votre disposition pour toute information complémentaire. I see that assay buffer can be used to extract cells for use with this kit. But there is not protocol describing how to use the assay buffer to produce the cell extract. Please provide a protocol. For cell samples: Start with ˜2x106 cells, suspend the cell pellet 500 μl (or ˜4 volumes) of the Assay Buffer on ice, homogenize using a Dounce homogenizer (10-50 passes) on ice, until efficient lysis is confirmed, by viewing the cells under the microscope. Spin down the sample and collect the supernatant. For enzymztic assay kits, it may be useful to deproteinate samples now by loading the supernatant into a 10kda spin column for deproteinzation. (Use the eluate for your subsequent assays.) Appropriate dilutions of the sample must be tested in order ensure the readings will fall within the linear range of the standard curve. I was wondering if Phenol Red would interfere with the Lactate assay kit? Although, can I make the standard curve up in the correspondent complete cell culture media (either RPMI/10%FCS+Phenol Red or DMEM/10%FCS+Phenol Red) or does it has to be in the Lactate assay buffer? I can confirm that this kit (ab6533:L-Lactate Assay Kit) uses 450 nm absorbance reading and hence the color should not affect the measurements. For those kits that measure absorbance at 570 nm, the red color could potentially interfere but only if a lot of media is used. Typically up to 50 ul medium per well does not affect the absorbance reading since the solution gets diluted with reaction mix. I have a question about this kit. Can't one just measure the increase in NADH produced at by measuring increased absorbance at OD340? Doesn't this correspond directly to lactate levels? Why is it necessary to measure production of formazon at OD450 intead? Yes, theoretically it can be done by monitoring the changes in NADH absorption at 340 nm. However, measuring at this OD requires expensive quartz microplates/cuvettes. Enzymatic assays like ab65331 are a better way to get more accurate measurements because the signal is more specific and magnified, allowing better sensitivity and accuracy. What is the standard protein host species? The standard is 98% pure sodium-L-lactate (chemical, not animal derived). For this kit (ab65331) 10-100mg tissue can be used depending upon the lactate in the tissue. This will require some optimization depending on the sample. We recommend using different dilutions of the homogenate so that the best dilution for results within the linear range of the std curve can be found. I. hope this information is useful to you. Please do not hesitate to contact us if you have any further questions. The assay kit is a fast and easy way to quantify lactate concentrations. It works well for whole cell lysates (WCE). 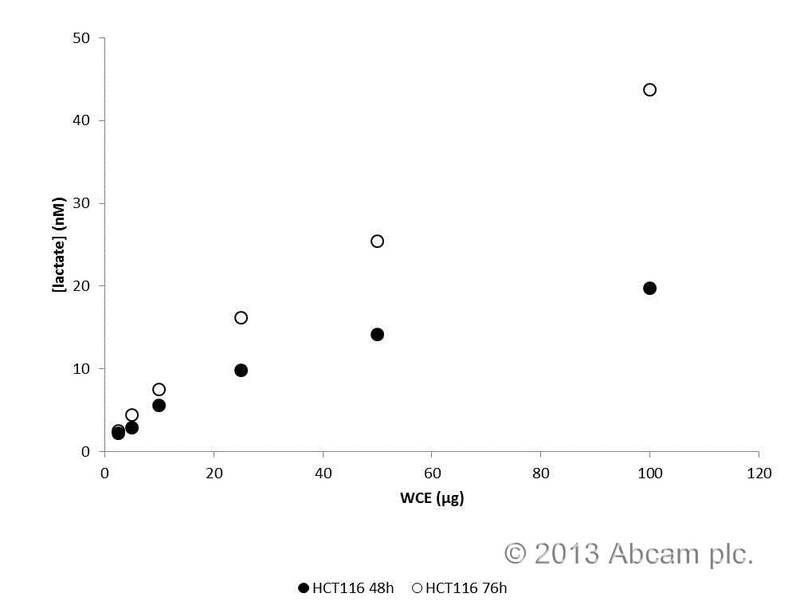 HCT116 cells were cultivated for 48 and 72 hrs in DMEM and sonified in assay buffer. 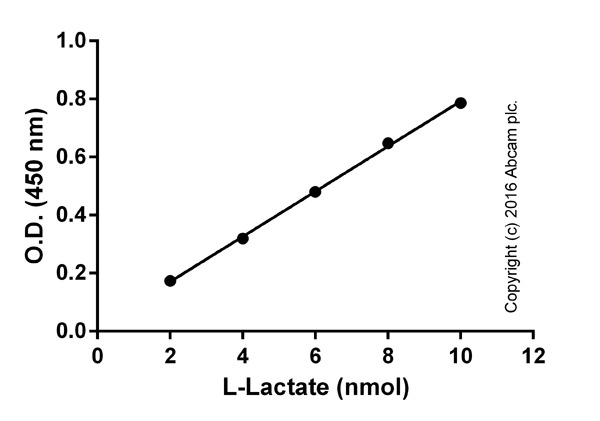 The lactate concentration is displayed in the enclosed figure, dependent on the amount of WCE. The kit only got 4 stars because it does not work in DMEM thus the supernatant of the cells could not be analysed. 10 µl DMEM in combination with assay buffer and the reaction mix gave absorbance values over 1.
we've been trying to assay extracellular lactate (in the medium) conditioned by Drosophila cells. We use Schneider's medium + 10% FBS. We've used your ab65331 kit and measured the medium with no cells, and then medium conditioned for 24hrs from cells. The medium is put over 10kDa spin columns (Ab93349) to rid it of HMW factors. However, the results indicate that there is quite a bit of lactate in the medium in the absence of cells (the wells were treated the same way as the medium that was taken from the cell cultures). I cannot find any mention of lactate or pyruvate in the Schneider medium formulation. Can you help me understand where the lactate is coming from? Fetal Bovin Serum contains LDH and will create high background levels. Using a low percent FBS (0.25-1%) or serum free media will reduce this background. Customer is wondering if this kit can also be used for colorometric detection. On our datasheet we have it listed as being able to produce color at 570 nm as well as fluorescence. With your other L-Lactate Assay Kit (colorometric), what is the difference? Is it the probe? Yes, our ab65330 L-Lactate Assay Kit (Fluorometric) can be used for colorimetric detection. The difference this kit has with the ab65331 L-Lactate Assay Kit (Colorimetric) is indeed mainly the probe, but the detection limits are also different for both. ab65330: 0.001-10 mM and ab65331 : 0.02 mM – 10 mM. I was looking for D-lactate assay kit and came to L-Lactate with Abcam. Would you please kindly advice me on the difference between D & L-Lactate and their measurement in clinical application. I know that D is at lower concentration vs L- one? Thank you for contacting us. Yes, D-lactate is produced in very low levels in mammals unless there are certain bacterial infections or trauma. L(+)-Lactate is the major stereoisomer of lactate formed in human intermediary metabolism and is present in blood. The lactate to pyruvate ratio reflects the redox state of the cell and describes the balance beween NAD+ and NADH, which is dependent on the interconversion of lactate and pyruvate via lactate dehydrogenase (LDH). Please let me know if you have any further questions.